We Now Accept PayPal Payments – Email us for more information! Introductory workshops for beginners are offered regularly by Joan Lithgow who is an experienced marimba teacher. 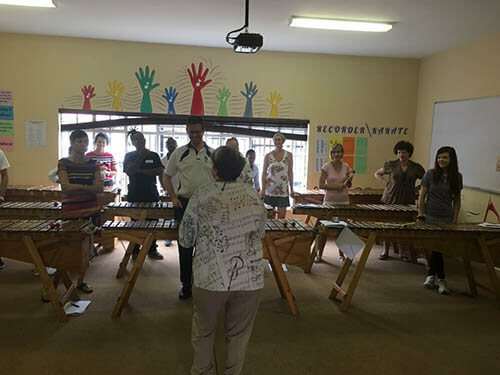 These workshops are fun-filled and cover all you need to know to start teaching marimbas in the classroom using a well thought-out and fool-proof teaching methodology. At the end of a 5-hour workshop you will have enough material and know-how for at least a term’s work! Graded on-going workshops are offered where new music, advanced playing techniques, ideas to enhance your sound with additional percussion instruments and simple improvisational skills are introduced. Workshops can also be custom-designed to suit the client. We also offer TEAM-BUILDING workshops using marimbas and music. No prior knowledge or musical experience is needed. 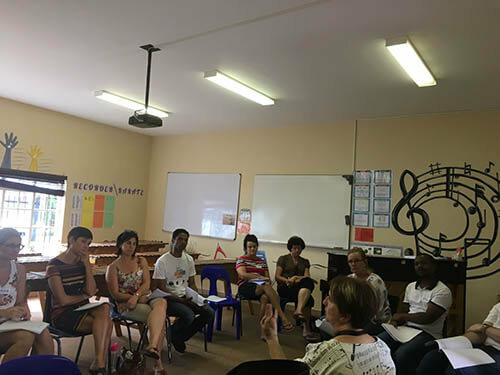 Teachers/facilitators can be trained within a relatively few hours and learners are able to play a piece of music in their very first lesson. Players can advance from beginners to fantastic performers within a short space of time. Concentration skills are greatly enhanced and worked upon when learning to play marimbas. Self-confidence and self-esteem are greatly boosted as there is a part for every child to play, regardless of ability. Playing music together is a team effort! Each and every member of the team is equally important. Because of the recommended technique of playing marimbas: hand to hand/ alternating hands—both sides of the brain are being exercised equally. This does not often happen in many other activities. Because it is recommended that hands are alternated all the time, crossing of the midline becomes second nature. Listening skills are greatly enhanced when playing marimbas: players need to play absolutely together to create a piece of music. Through various games and exercises learners’ aural training skills may be developed. The science of sound production can be demonstrated and studied through the marimba. Through singing and spelling games on the marimba, language skills and spelling is improved. It is a known fact that maths and music are inter-related. Marimba music is strongly based on patterning: maths is also full of patterning. It goes without saying that the one helps and reinforces the other. The bars on the marimba are fairly wide so learners with poor fine-motor coordination are still able to play with ease. Physically and mentally challenged individuals can play marimbas and be part of a marimba band. Fine- and gross-motor coordination are constantly being worked on when the learners are playing marimbas. Learners who do not have dexterity in their fingers for whatever reason often find it difficult, if not impossible, to play a melodic musical instrument. 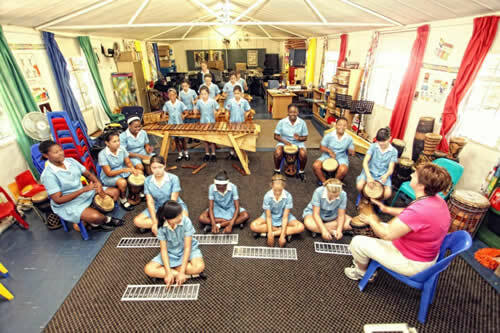 The marimba offers these learners the opportunity to play a melodic instrument. The nature of the music for marimbas is such that there are very easy parts and then there are parts that are graded according to abilities. By using dummy keyboards in the classroom every learner is focused on playing at the same time. This alleviates discipline problems. With imagination, patience and a sense of fun the music classroom is transformed into a magical soundscape. All genres of music can be played on marimbas. The marimba is a robust, low maintenance, portable instrument that does not need electricity to operate! The instruments sell themselves in the classroom and EVERYONE wants to play! There are lovely maths games that can be combined with marimbas to encourage and enhance maths learning. WHY YOU SHOULD CHOOSE TO USE THE MARIMBA WORKSHOP MARIMBAS? Hand-made with quality materials by an experienced craftsman. Tuned electronically by experienced tuners. Designed by Orff specialists who understand music teaching in the classroom. The instruments are durable and easily stored and transported. the band plays at functions. Covers are available to keep the marimbas in tip-top shape. Regular marimba courses are offered by an experienced marimba teacher. grade 0 to grade 12. A pre-school programme using these marimbas is available. children can play on the bass at the same time. This cuts down on space required. Dummy keyboards are available to engage all the children in the lesson at the same time. There are over 500 marimbas made by the Marimba Workshop in the country. We Now Accept PayPal Payments - Email us for more information! 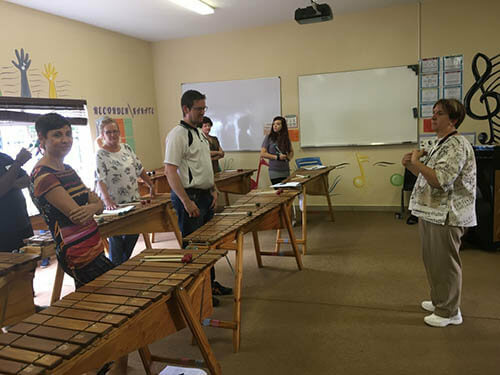 "As a teacher, with no previous marimba training, who had successfully taught school marimba groups for a few years, one group even performing on national TV, I wondered whether a 300km to Bedfordview was worth the effort. I finished the workshop excited and have since seen the enormous value in practice. Joan of Marimba Workshop offers a fully evolved instrumental teaching method that covers every aspect from technique and general musical skills to class control. Packed into a single most enjoyable, interactive hands on Saturday morning session, I'd challenge anyone to show me better value for R500 in SA today and the value has impacted on 200 primary marimba players. Here is a private musical educational development in a class of its own."